IBM WebSphere QualityStage provides data cleansing capabilities to help ensure quality and consistency by standardizing, validating, matching, and merging information to create comprehensive and authoritative information for multiple uses. IBM Information Server is a revolutionary software platform that helps organizations derive more value from the complex heterogeneous information that is spread across their systems. It enables organizations to integrate disparate data and deliver trusted information wherever and whenever needed, in line and in context, to specific people, applications, and processes. 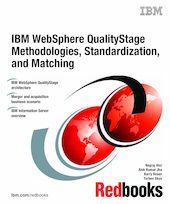 This IBM Redbooks publication documents the procedures for implementing IBM WebSphere QualityStage and related technologies using a typical merger and acquisition financial services business scenario. The scenario covers all dimensions of data cleansing, standardization, and matching rules, job design and deployment through a data integration life cycle. The book offers a step-by-step approach to implementing IBM WebSphere QualityStage on Red Hat Enterprise Linux 4.0 platform accessing information that is stored on IBM z/OS and IBM AIX platforms. If you are an IT architect, Information Management specialist, or Information Integration specialist who is responsible for developing IBM WebSphere QualityStage on a Red Hat Enterprise Linux 4.0 platform, you will find the information in this book helpful.